Ever since Dan Dierdorf announced he was retiring from NFL broadcasting, there was going to be some shuffling going on at the NFL on CBS. Dierdorf was last on the B team with Greg Gumbel. Considering that the B team was a coveted position as that crew traditionally got to call a Divisional Playoffs game (although CBS and Fox will alternate having a second Divisional game with NBC getting one starting this year), CBS was making a relatively big call. Pretty much everyone, myself included, wanted CBS to promote the C team of Ian Eagle and Dan Fouts. Heck, I even expected them to promote them rather than promote an analyst to work with Gumbel and predicted them to do so a few weeks ago. Well, guess what Richard Deitsch just reported about an hour ago. 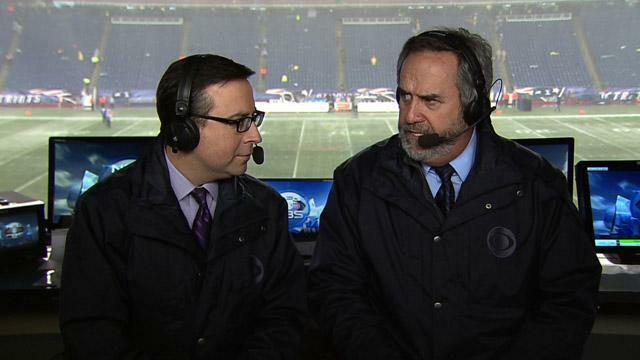 Eagle and Fouts have developed into perhaps my favorite NFL television broadcasting crew. It does not hurt that both have been pretty good broadcasters for many years, but also what is great about this crew is that they developed very good chemistry, which is hard to create. Also, both have very good senses of humor and seem to make games fun without turning them into clown shows. I have always enjoyed watching a game from this crew and now more of America will get to enjoy them as well. What also makes the B crew even more desirable is that they will be getting a number of lead CBS games on Sundays. That is because the lead CBS crew of Jim Nantz and Phil Simms will be doing the new Thursday night package and there will be Sundays where they do not call a game, likely singleheaders. So what will happen with Gumbel? Deitsch reported that he is moving down to the C crew with newcomer Trent Green, who was hired as a game analyst in April. I was thinking that Gumbel would end up working with Rich Gannon and was not sure if Green would be put on a relatively high crew, so I don't get everything right. Now when you take a gander at the NFL on CBS schedule (heck, you can even bookmark it! ), there are a few weeks with eight games (weeks 3, 15 and 17 although those three are flex weeks). However, I did not include an eight crew because the networks have not had the need for the eighth crew unless in case of emergency due to the expanded Thursday night slate a couple of years back. If I had to guess an eighth CBS crew, it would be Dave Ryan and Adam Archuleta from CBS Sports Network. Marv Albert is concentrating on his basketball roles. Eagle and Fouts deserve their chance at number 2. AS WELL AS an individual likely can\'t take the all of us alternative, NFL Super-cast, that's shown through DirecTV. these international locations live stream nfl include Canada, Mexico, Bermuda along with the Bahamas.